received more than I could hope for in good cheer, hospitality, and presents. The start of 2013 felt like any ol’ day. I wasn’t so much motivated in 2013, as much as I was motivated by my friends. There was something about 2012 that case a shadow over a lot of people I care for. Whether it be health concerns or financial issues, it seems like everyone is looking forward to 2013. I’ve had 2 friends go back to school in the end of last year, another friend starting a new job in the new year, and 2 people graduate from nursing school. There is A LOT of optimism and new beginnings going on. So, I should make this year a productive year, no? I’m trying to be better about letting time go by with the only thing to mark the days, being work during the weekdays. I got a new shiny sewing machine for Christmas. :D I also received a beginner pattern, fabric, rick rack trim and bias tape. My very first project was making some pillows out of used bed sheets. 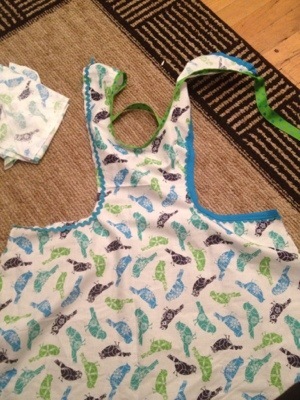 Once I confirmed that I threaded the top and bobbin correctly, I was in business and tried my hand at making an apron. Cutting the pattern and fabric was pretty straight forward. 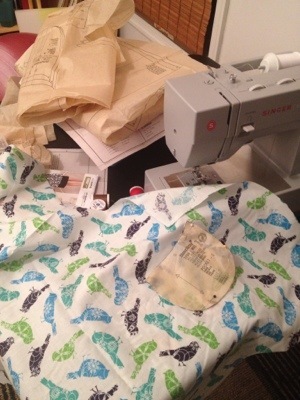 After getting a hang at sewing corners, I was in business, more or less. I still need to figure out the right amount of tension and some thread clumping when it comes to sewing multiple layers (fabric, trimming, bias, and ribbon, for instance). The pockets didn’t come out very good, so I might rip out the seams and try again. Also in my haste, I sewed the back tie on the wrong side. I’ve finished the trimming on the neck and both sides (the picture on the left is before I was done). It came out pretty well, if I say so myself. I think all in all it came out pretty well for my first project. Some bunches here and there, but it adds character. I didn’t have enough trim to finish the hem, though. It’s still functional, currently, at least. 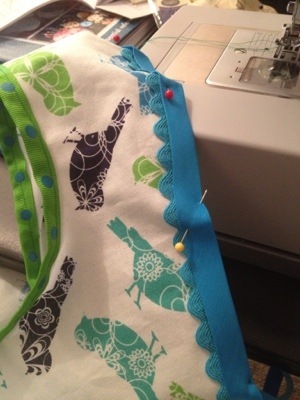 I just broke one needle ( ;( boo) and the thread tangled a bunch. So… that was my Sunday! Here is to a new year and trying new things! impressed by your power… and after all this time i reaffirm the fact? that you are or seem so new yorker. my life after fred nietzsche is rolling out differently. what would he say. Haha, is “sewing aprons” totally NY? It’s probably very Brooklyn. Somewhere in Brooklyn, there is a cute hipster girl churning butter.